How much total power does your home theatre system or your computer system use every year .... when everything has been switched off?? Oh .... and those charges appear on your Utility bill each and every month. That's what you are paying for. Now you can be empowered to Save $100's on electric bills! Are electricity bills rising where you are, too? Did you know you can track-down which appliances and electrical devices that are wasting your money....Easily and Inexpensively. 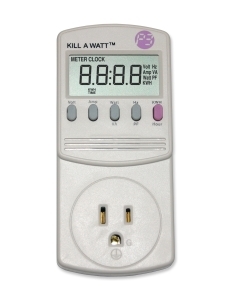 The 'Kill-A-Watt' is a simple device that will tell you a number of important aspects about any device that's plugged into it. the quality of your power by monitoring the Voltage, Line Frequency, and Power Factor. It displays: Volts, Amps, Watts, Hz. VA, PF. 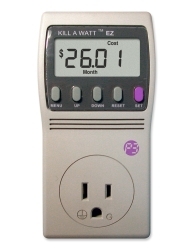 With the Kill A Watt EZ you can actually calculate your cumulative electrical expenses as well as forecast by the day, week, month or even the entire year. Helps determine which appliances might be candidates for replacement based on energy inefficiencies. Now you can arm yourself with the knowledge imparted by the above devices. First of all the appliances will be protected by the built-in surge protector.